Opening Reception: TAXI GANG’s Exclamation Point. 7:00pm til 11:00pm, Sat Dec 1 [tomorrow!] @ The Fridge. Exclamation point. is the first-ever solo show by Owner and Gallery Director Alex Goldstein. The exhibit unites Goldstein’s heavily graphic design-influenced style with the visual and text-based themes he has been working with for many years in the streets of NY and DC. One hundred stencil and spray paint works on paper will be displayed in the gallery; two multi-layered images repeated in differing viewpoints: a boy with hand grenade, inspired by Diane Arbus, and a girl with two guns blazing. “These are images of empowerment and rage. I’m a staunch pacifist. I’m terrified of guns, but I’m obsessed with these images because of the part that they play in our society,” says Goldstein. Goldstein will present paintings on paper, mixed media, and a new mural on the exterior walls of The Fridge. The exhibition will evolve over the course of the month; buyers are invited to take the works directly off the walls instead of waiting until the exhibit comes down. 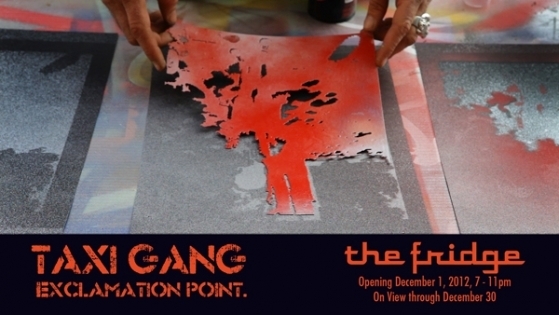 Goldstein will hold a stencil and spray paint workshop on December 9, 11 – 1pm. Participants may bring images that they want to make into stencils and any clothing or objects to paint. The artist will also provide stencils. Materials and supplies $20. Previous Post Caves and Buddhas, You’re Here!